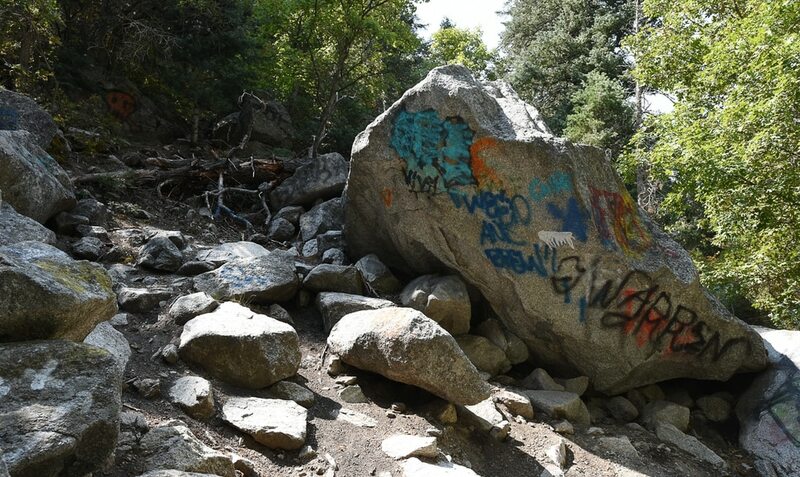 (Francisco Kjolseth | The Salt Lake Tribune) Graffiti has proliferated in lower Little Cottonwood Canyon, where vandals, often wielding cans of florescent-colored spray paint, have covered granite faces, trees and structures. The vandalism is particularly apparent along the Temple Quarry Trail and the creek at the Moon Rock swimming hole and former pavilion site. Volunteers using donated equipment and solvents spend thousands of hours removing the paint from the rocks only to see graffiti return to the same faces or on rock nearby. (Francisco Kjolseth | The Salt Lake Tribune) Graffiti has proliferated in lower Little Cottonwood Canyon, where vandals, often wielding cans of fluorescent-colored spray paint, have covered granite faces, trees and structures. The vandalism is particularly apparent along the Temple Quarry Trail and the creek at the Moon Rock swimming hole and former pavilion site. Volunteers using donated equipment and solvents spend thousands of hours removing the paint from the rocks only to see graffiti return to the same faces or on rock nearby. (Francisco Kjolseth | The Salt Lake Tribune) Graffiti has proliferated in lower Little Cottonwood Canyon, where vandals, often wielding cans of fluorescent-colored spray paint, have covered granite faces, trees and structures. The vandalism is particularly apparent along the Temple Quarry Trail and the creek at the Moon Rock swimming hole and former pavilion site. Volunteers using donated equipment and solvents spend thousands of hours removing the paint from the rocks only to see graffiti return to the same faces or on rock nearby. (Francisco Kjolseth | The Salt Lake Tribune) Graffiti has proliferated in lower Little Cottonwood Canyon, where vandals, often wielding cans of fluorescent-colored spray paint, have covered granite faces, trees and structures. The vandalism is particularly apparent along the Temple Quarry Trail and the creek at the Moon Rock swimming hole and former pavilion site. Volunteers using donated equipment and solvents spend thousands of hours removing the paint from the rocks only to see graffiti return to the same faces or on rock nearby. (Francisco Kjolseth | The Salt Lake Tribune) Graffiti has proliferated in lower Little Cottonwood Canyon, where vandals, often wielding cans of fluorescent-colored spray paint, have covered granite faces, trees and structures. The vandalism is particularly apparent along the Temple Quarry Trail and the creek at the Moon Rock swimming hole and former pavilion site. Volunteers using donated equipment and solvents spend thousands of hours removing the paint from the rocks only to see graffiti return to the same faces or on rock nearby. (Francisco Kjolseth | The Salt Lake Tribune) Graffiti has proliferated in lower Little Cottonwood Canyon, where vandals, often wielding cans of fluorescent-colored spray paint, have covered granite faces, trees and structures. The vandalism is particularly apparent along the Temple Quarry Trail and the creek at the Moon Rock swimming hole and former pavilion site. Volunteers using donated equipment and solvents spend thousands of hours removing the paint from the rocks only to see graffiti return to the same faces or on rock nearby. (Francisco Kjolseth | The Salt Lake Tribune) Graffiti has proliferated in lower Little Cottonwood Canyon, where vandals, often wielding cans of fluorescent-colored spray paint, have covered granite faces, trees and structures. The vandalism is particularly apparent along the Temple Quarry Trail and the creek at the Moon Rock swimming hole and former pavilion site. Volunteers using donated equipment and solvents spend thousands of hours removing the paint from the rocks only to see graffiti return to the same faces or on rock nearby. (Francisco Kjolseth | The Salt Lake Tribune) Graffiti has proliferated in lower Little Cottonwood Canyon, where vandals, often wielding cans of fluorescent-colored spray paint, have covered granite faces, trees and structures. The vandalism is particularly apparent along the Temple Quarry Trail and the creek at the Moon Rock swimming hole and former pavilion site. Volunteers using donated equipment and solvents spend thousands of hours removing the paint from the rocks only to see graffiti return to the same faces or on rock nearby. (Francisco Kjolseth | The Salt Lake Tribune) Scott Whipperman covers up graffiti that has proliferated in lower Little Cottonwood Canyon, where vandals, often wielding cans of florescent-colored spray paint, have covered granite faces, trees and structures. The vandalism is particularly apparent along the Temple Quarry Trail and the creek at the Moon Rock swimming hole and former pavilion site. Volunteers using donated equipment and solvents spend thousands of hours removing the paint from the rocks only to see graffiti return to the same faces or on rock nearby. (Francisco Kjolseth | The Salt Lake Tribune) Graffiti has proliferated in lower Little Cottonwood Canyon, where vandals, often wielding cans of fluorescent-colored spray paint, have covered granite faces, trees and structures. The vandalism is particularly apparent along the Temple Quarry Trail and the creek at the Moon Rock swimming hole and former pavilion site. Volunteers using donated equipment and solvents spend thousands of hours removing the paint from the rocks only to see graffiti return to the same faces or on rock nearby. (Francisco Kjolseth | The Salt Lake Tribune) Graffiti has proliferated in lower Little Cottonwood Canyon, where vandals, often wielding cans of fluorescent-colored spray paint, have covered granite faces, trees and structures. The vandalism is particularly apparent along the Temple Quarry Trail and the creek at the Moon Rock swimming hole and former pavilion site. Volunteers using donated equipment and solvents spend thousands of hours removing the paint from the rocks only to see graffiti return to the same faces or on rock nearby. (Francisco Kjolseth | The Salt Lake Tribune) Graffiti has proliferated in lower Little Cottonwood Canyon, where vandals, often wielding cans of fluorescent-colored spray paint, have covered granite faces, trees and structures. The vandalism is particularly apparent along the Temple Quarry Trail and the creek at the Moon Rock swimming hole and former pavilion site. Volunteers using donated equipment and solvents spend thousands of hours removing the paint from the rocks only to see graffiti return to the same faces or on rock nearby. (Francisco Kjolseth | The Salt Lake Tribune) Graffiti has proliferated in lower Little Cottonwood Canyon, where vandals, often wielding cans of fluorescent-colored spray paint, have covered granite faces, trees and structures. The vandalism is particularly apparent along the Temple Quarry Trail and the creek at the Moon Rock swimming hole and former pavilion site. Volunteers using donated equipment and solvents spend thousands of hours removing the paint from the rocks only to see graffiti return to the same faces or on rock nearby. (Francisco Kjolseth | The Salt Lake Tribune) Graffiti has proliferated in lower Little Cottonwood Canyon, where vandals, often wielding cans of fluorescent-colored spray paint, have covered granite faces, trees and structures. The vandalism is particularly apparent along the Temple Quarry Trail and the creek at the Moon Rock swimming hole and former pavilion site. Volunteers using donated equipment and solvents spend thousands of hours removing the paint from the rocks only to see graffiti return to the same faces or on rock nearby. (Francisco Kjolseth | The Salt Lake Tribune) Graffiti has proliferated in lower Little Cottonwood Canyon, where vandals, often wielding cans of fluorescent-colored spray paint, have covered granite faces, trees and structures. The vandalism is particularly apparent along the Temple Quarry Trail and the creek at the Moon Rock swimming hole and former pavilion site. Volunteers using donated equipment and solvents spend thousands of hours removing the paint from the rocks only to see graffiti return to the same faces or on rock nearby. (Francisco Kjolseth | The Salt Lake Tribune) Scott Whipperman, left, and Michael Nebeker cover up graffiti that has proliferated in lower Little Cottonwood Canyon, where vandals, often wielding cans of fluorescent-colored spray paint, have covered granite faces, trees and structures. The vandalism is particularly apparent along the Temple Quarry Trail and the creek at the Moon Rock swimming hole and former pavilion site. Volunteers using donated equipment and solvents spend thousands of hours removing the paint from the rocks only to see graffiti return to the same faces or on rock nearby. (Francisco Kjolseth | The Salt Lake Tribune) Graffiti has proliferated in lower Little Cottonwood Canyon, where vandals, often wielding cans of fluorescent-colored spray paint, have covered granite faces, trees and structures. The vandalism is particularly apparent along the Temple Quarry Trail and the creek at the Moon Rock swimming hole and former pavilion site. Volunteers using donated equipment and solvents spend thousands of hours removing the paint from the rocks only to see graffiti return to the same faces or on rock nearby. (Francisco Kjolseth | The Salt Lake Tribune) Graffiti has proliferated in lower Little Cottonwood Canyon, where vandals, often wielding cans of fluorescent-colored spray paint, have covered granite faces, trees and structures. The vandalism is particularly apparent along the Temple Quarry Trail and the creek at the Moon Rock swimming hole and former pavilion site. Volunteers using donated equipment and solvents spend thousands of hours removing the paint from the rocks only to see graffiti return to the same faces or on rock nearby. (Francisco Kjolseth | The Salt Lake Tribune) Graffiti has proliferated in lower Little Cottonwood Canyon, where vandals, often wielding cans of fluorescent-colored spray paint, have covered granite faces, trees and structures. The vandalism is particularly apparent along the Temple Quarry Trail and the creek at the Moon Rock swimming hole and former pavilion site. Volunteers using donated equipment and solvents spend thousands of hours removing the paint from the rocks only to see graffiti return to the same faces or on rock nearby. (Francisco Kjolseth | The Salt Lake Tribune) Graffiti has proliferated in lower Little Cottonwood Canyon, where vandals, often wielding cans of fluorescent-colored spray paint, have covered granite faces, trees and structures. The vandalism is particularly apparent along the Temple Quarry Trail and the creek at the Moon Rock swimming hole and former pavilion site. Volunteers using donated equipment and solvents spend thousands of hours removing the paint from the rocks only to see graffiti return to the same faces or on rock nearby. (Francisco Kjolseth | The Salt Lake Tribune) Graffiti has proliferated in lower Little Cottonwood Canyon, where vandals, often wielding cans of fluorescent-colored spray paint, have covered granite faces, trees and structures. The vandalism is particularly apparent along the Temple Quarry Trail and the creek at the Moon Rock swimming hole and former pavilion site. Volunteers using donated equipment and solvents spend thousands of hours removing the paint from the rocks only to see graffiti return to the same faces or on rock nearby. (Francisco Kjolseth | The Salt Lake Tribune) Graffiti has proliferated in lower Little Cottonwood Canyon, where vandals, often wielding cans of fluorescent-colored spray paint, have covered granite faces, trees and structures. The vandalism is particularly apparent along the Temple Quarry Trail and the creek at the Moon Rock swimming hole and former pavilion site. Volunteers using donated equipment and solvents spend thousands of hours removing the paint from the rocks only to see graffiti return to the same faces or on rock nearby. (Francisco Kjolseth | The Salt Lake Tribune) Graffiti has proliferated in lower Little Cottonwood Canyon, where vandals, often wielding cans of fluorescent-colored spray paint, have covered granite faces, trees and structures. The vandalism is particularly apparent along the Temple Quarry Trail and the creek at the Moon Rock swimming hole and former pavilion site. Volunteers using donated equipment and solvents spend thousands of hours removing the paint from the rocks only to see graffiti return to the same faces or on rock nearby. (Francisco Kjolseth | The Salt Lake Tribune) Graffiti has proliferated in lower Little Cottonwood Canyon, where vandals, often wielding cans of fluorescent-colored spray paint, have covered granite faces, trees and structures. The vandalism is particularly apparent along the Temple Quarry Trail and the creek at the Moon Rock swimming hole and former pavilion site. Volunteers using donated equipment and solvents spend thousands of hours removing the paint from the rocks only to see graffiti return to the same faces or on rock nearby. (Francisco Kjolseth | The Salt Lake Tribune) Graffiti has proliferated in lower Little Cottonwood Canyon, where vandals, often wielding cans of fluorescent-colored spray paint, have covered granite faces, trees and structures. The vandalism is particularly apparent along the Temple Quarry Trail and the creek at the Moon Rock swimming hole and former pavilion site. Volunteers using donated equipment and solvents spend thousands of hours removing the paint from the rocks only to see graffiti return to the same faces or on rock nearby. (Francisco Kjolseth | The Salt Lake Tribune) Graffiti has proliferated in lower Little Cottonwood Canyon, where vandals, often wielding cans of fluorescent-colored spray paint, have covered granite faces, trees and structures. The vandalism is particularly apparent along the Temple Quarry Trail and the creek at the Moon Rock swimming hole and former pavilion site. Volunteers using donated equipment and solvents spend thousands of hours removing the paint from the rocks only to see graffiti return to the same faces or on rock nearby. (Francisco Kjolseth | The Salt Lake Tribune) Graffiti has proliferated in lower Little Cottonwood Canyon, where vandals, often wielding cans of fluorescent-colored spray paint, have covered granite faces, trees and structures. The vandalism is particularly apparent along the Temple Quarry Trail and the creek at the Moon Rock swimming hole and former pavilion site. Volunteers using donated equipment and solvents spend thousands of hours removing the paint from the rocks only to see graffiti return to the same faces or on rock nearby. 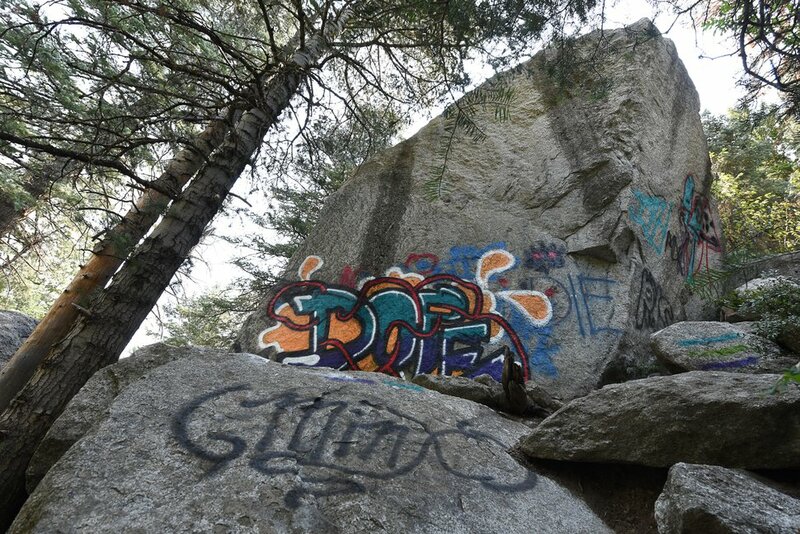 (Francisco Kjolseth | The Salt Lake Tribune) Scott Whipperman talks about the graffiti that has proliferated in lower Little Cottonwood Canyon, where vandals, often wielding cans of fluorescent-colored spray paint, have covered granite faces, trees and structures. The vandalism is particularly apparent along the Temple Quarry Trail and the creek at the Moon Rock swimming hole and former pavilion site. Volunteers using donated equipment and solvents spend thousands of hours removing the paint from the rocks only to see graffiti return to the same faces or on rock nearby. (Francisco Kjolseth | The Salt Lake Tribune) Graffiti has proliferated in lower Little Cottonwood Canyon, where vandals, often wielding cans of fluorescent-colored spray paint, have covered granite faces, trees and structures. The vandalism is particularly apparent along the Temple Quarry Trail and the creek at the Moon Rock swimming hole and former pavilion site. Volunteers using donated equipment and solvents spend thousands of hours removing the paint from the rocks only to see graffiti return to the same faces or on rock nearby. (Francisco Kjolseth | The Salt Lake Tribune) Graffiti has proliferated in lower Little Cottonwood Canyon, where vandals, often wielding cans of fluorescent-colored spray paint, have covered granite faces, trees and structures. The vandalism is particularly apparent along the Temple Quarry Trail and the creek at the Moon Rock swimming hole and former pavilion site. Volunteers using donated equipment and solvents spend thousands of hours removing the paint from the rocks only to see graffiti return to the same faces or on rock nearby. (Francisco Kjolseth | The Salt Lake Tribune) Michael Nebeker, left, and Scott Whipperman cover up graffiti that has proliferated in lower Little Cottonwood Canyon, where vandals, often wielding cans of fluorescent-colored spray paint, have covered granite faces, trees and structures. The vandalism is particularly apparent along the Temple Quarry Trail and the creek at the Moon Rock swimming hole and former pavilion site. Volunteers using donated equipment and solvents spend thousands of hours removing the paint from the rocks only to see graffiti return to the same faces or on rock nearby. (Francisco Kjolseth | The Salt Lake Tribune) Graffiti has proliferated in lower Little Cottonwood Canyon, where vandals, often wielding cans of fluorescent-colored spray paint, have covered granite faces, trees and structures. The vandalism is particularly apparent along the Temple Quarry Trail and the creek at the Moon Rock swimming hole and former pavilion site. Volunteers using donated equipment and solvents spend thousands of hours removing the paint from the rocks only to see graffiti return to the same faces or on rock nearby. (Francisco Kjolseth | The Salt Lake Tribune) Michel Nebeker works to cover up or clean up graffiti that has proliferated in lower Little Cottonwood Canyon, where vandals, often wielding cans of fluorescent-colored spray paint, have covered granite faces, trees and structures. The vandalism is particularly apparent along the Temple Quarry Trail and the creek at the Moon Rock swimming hole and former pavilion site. Volunteers using donated equipment and solvents spend thousands of hours removing the paint from the rocks only to see graffiti return to the same faces or on rock nearby. (Francisco Kjolseth | The Salt Lake Tribune) Graffiti has proliferated in lower Little Cottonwood Canyon, where vandals, often wielding cans of fluorescent-colored spray paint, have covered granite faces, trees and structures. The vandalism is particularly apparent along the Temple Quarry Trail and the creek at the Moon Rock swimming hole and former pavilion site. Volunteers using donated equipment and solvents spend thousands of hours removing the paint from the rocks only to see graffiti return to the same faces or on rock nearby. (Francisco Kjolseth | The Salt Lake Tribune) Graffiti has proliferated in lower Little Cottonwood Canyon, where vandals, often wielding cans of fluorescent-colored spray paint, have covered granite faces, trees and structures. The vandalism is particularly apparent along the Temple Quarry Trail and the creek at the Moon Rock swimming hole and former pavilion site. Volunteers using donated equipment and solvents spend thousands of hours removing the paint from the rocks only to see graffiti return to the same faces or on rock nearby. (Francisco Kjolseth | The Salt Lake Tribune) Graffiti has proliferated in lower Little Cottonwood Canyon, where vandals, often wielding cans of fluorescent-colored spray paint, have covered granite faces, trees and structures. The vandalism is particularly apparent along the Temple Quarry Trail and the creek at the Moon Rock swimming hole and former pavilion site. Volunteers using donated equipment and solvents spend thousands of hours removing the paint from the rocks only to see graffiti return to the same faces or on rock nearby. (Francisco Kjolseth | The Salt Lake Tribune) Graffiti has proliferated in lower Little Cottonwood Canyon, where vandals, often wielding cans of fluorescent-colored spray paint, have covered granite faces, trees and structures. The vandalism is particularly apparent along the Temple Quarry Trail and the creek at the Moon Rock swimming hole and former pavilion site. Volunteers using donated equipment and solvents spend thousands of hours removing the paint from the rocks only to see graffiti return to the same faces or on rock nearby. (Francisco Kjolseth | The Salt Lake Tribune) Graffiti has proliferated in lower Little Cottonwood Canyon, where vandals, often wielding cans of fluorescent-colored spray paint, have covered granite faces, trees and structures. The vandalism is particularly apparent along the Temple Quarry Trail and the creek at the Moon Rock swimming hole and former pavilion site. Volunteers using donated equipment and solvents spend thousands of hours removing the paint from the rocks only to see graffiti return to the same faces or on rock nearby. (Francisco Kjolseth | The Salt Lake Tribune) Graffiti has proliferated in lower Little Cottonwood Canyon, where vandals, often wielding cans of fluorescent-colored spray paint, have covered granite faces, trees and structures. The vandalism is particularly apparent along the Temple Quarry Trail and the creek at the Moon Rock swimming hole and former pavilion site. Volunteers using donated equipment and solvents spend thousands of hours removing the paint from the rocks only to see graffiti return to the same faces or on rock nearby. (Francisco Kjolseth | The Salt Lake Tribune) Graffiti has proliferated in lower Little Cottonwood Canyon, where vandals, often wielding cans of fluorescent-colored spray paint, have covered granite faces, trees and structures. The vandalism is particularly apparent along the Temple Quarry Trail and the creek at the Moon Rock swimming hole and former pavilion site. Volunteers using donated equipment and solvents spend thousands of hours removing the paint from the rocks only to see graffiti return to the same faces or on rock nearby. Scott Whipperman is a man on a mission. His task brings to mind the mythical figure Sisyphus, condemned to rolling a stone up a hill for eternity. 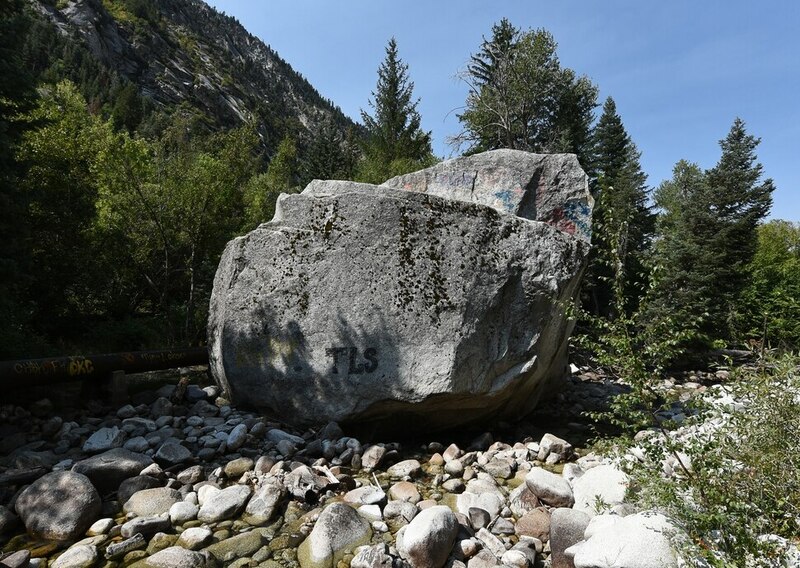 Whipperman’s rocks don’t need to be moved but rather cleared of spray-painted graffiti that keeps reappearing — endlessly — on Little Cottonwood Canyon’s granite boulders. The vandalism has reached an epidemic in the beloved natural area that once was mined for the stones that gave rise to downtown Salt Lake City’s iconic Mormon temple and other monumental buildings, and has long provided drinking water and outdoor recreation. The scarring, much of it associated with gangs, is concentrated in the canyon’s lower reaches, along the Temple Quarry Trail to the old pavilion near Moon Rock, where vandals wielding cans of fluorescent-colored spray paint regularly blight rock faces, trees and structures. The U.S. Forest Service lacks the resources to address the problem on land it administers and relies on the public to clean up the mess. Whipperman, who lives near the canyon mouth in Sandy, coordinates volunteers, who spend thousands of hours removing the paint using donated equipment and pricey environmentally friendly solvents. 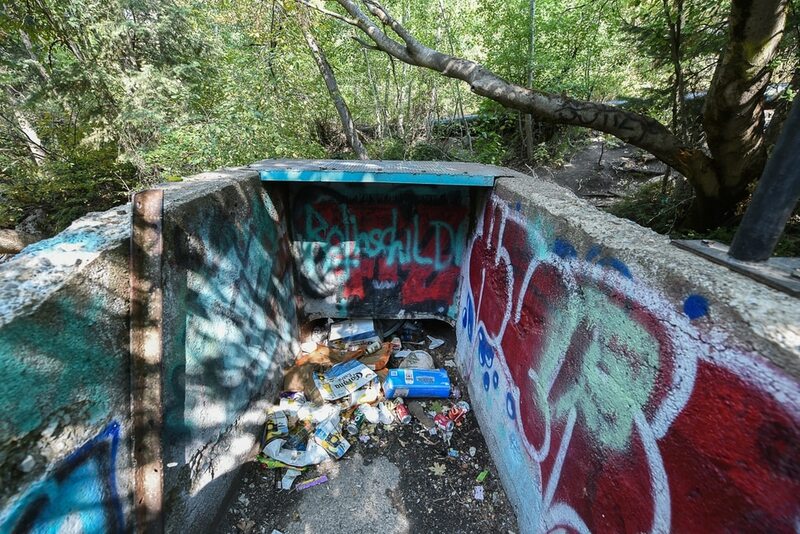 “My goal is, by snowfall, to have all the graffiti removed from Little Cottonwood Canyon,” he said recently while rolling paint over a historic concrete water-diversion structure that was covered with pictures and gang insignia. Some images appeared well-practiced and carefully stenciled, like one showing the Tasmanian Devil cartoon character. Others were gang tags, barely legible, clever and inane, some loving, some hateful. Graffiti is a scourge on public lands around the West, especially in national parks and monuments where thoughtless visitors often scratch names and pronouncements into rocks and trees that had already been casually defaced. But the taggers operating in Little Cottonwood are more malicious, persistent and systematic. Their spray-painted handiwork imposes an in-your-face stain on the viewshed that no one can miss. Whipperman sees erasing it as the best way to deter future abuse. His usual weapon is a power washer he wields to blast paint off rocks. But most volunteers turn to special solvents and spend hours scrubbing to clean a single rock. Over three days next month, about 200 Mormon missionaries will join the effort in a massive service project. Moon Rock, towering over the creek opposite the concrete flume, has been cleaned at least half a dozen times, according to Whipperman. Yet fresh graffiti — again — lined its upper edge this day, and the creek was littered with clothing, Slurpee cups, beer cans and other evidence of notorious nocturnal activity. Even rocks in the creek were tagged, one with a West Valley City ZIP code — 84119. “It has been relentless. It is a social problem, and it’s spreading,” said Julia Geisler of the Salt Lake Climbers Alliance, noting that graffiti now increasingly mars neighboring Big Cottonwood and Ferguson canyons. Also getting hit are the large chunks of granite that climbers enjoy scaling along the Quarry Trail. These are remnants of the historic quarry that supplied building stones for the Salt Lake Valley’s pioneers. The graffiti not only ruins the rocks’ beauty and historic integrity, but it also makes them unclimbable, coating their friction surfaces with paint. Volunteers wearing gloves and protective suits perform the hard work of applying Elephant Snot, the solvent deemed safe to use in watersheds tapped for drinking water. Designed for porous surfaces, it costs $86.99 a gallon on Amazon, where a can of Krylon “Glitter Blast” spray paint goes for $6.64. Whipperman hopes a message is sent when the graffiti is removed and signs put up warning that vandalism carries a possible six-month jail sentence: Painting these rocks is not OK.
Graffiti is a crime against a community, but here, along a wooded stream below towering granite buttresses that frame the canyon’s mouth, the offense cuts deeper; it’s an outrage against the natural environment. But the few culprits who have been caught face minor consequences. There have been some prosecutions, according to Unified Police Sgt. James Blanton, but none has resulted in jail time. The old stone pavilion upstream from Moon Rock has been blanketed in graffiti, as have the rocks in a scree field above the now-reclaimed site. A party spot, the pavilion appears on websites where taggers post photos of their handiwork, according to Dave Fields, general manager at the up-canyon ski resort Snowbird. Snowbird paid for the pavilion’s removal last year, and volunteers have spent hundreds of hours cleaning up this site. The canyon’s defenders hoped it would remain unmolested, but vandals simply moved up the hill, where rocks now bear freshly painted arrows directing visitors to the latest gallery where lettering and pictures appear on dozens of boulders. The word “dope,” in carefully painted fat green and purple letters, is sprawled across one granite face over someone else’s illegible graffiti. A kind of sad commentary on the visual insults the taggers have left behind, this painting could be considered art if only the “artists” had applied it to a canvas and hung it in their own neighborhoods. There is no yellow police tape, but this slice of nature is every bit a crime scene. And it forces into action — yet again — Whipperman and his Sisyphean allies.